As a manufacturer, AMC had the ability to pull off some pretty phenomenal automotive feats on a shoe-string budget, and at times that could be a pretty worn shoe-string. However, it could also be a company that continues to be a source of some frustration. Take this 1970 Javelin SST for example. This may or may not be a genuine Mark Donohue Special, but without the car’s original paperwork, we will probably never know for certain. The owner is honest enough to acknowledge this fact. Barn Finder Rocco B referred the Javelin through to us, so thank you for that Rocco. 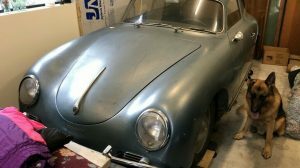 What is certain is that it is a solid car that is a prime candidate for restoration. Located in Littleton, Colorado, it is listed for sale here at Hemmings. 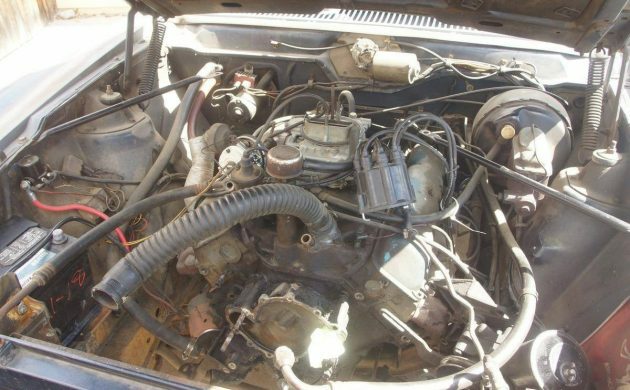 The owner has set an asking price of $9,500 for the Javelin but does mention that this is negotiable. This is one solid and clean car. The owner provides a nice collection of clear and detailed photos, and the car is absolutely rock solid. 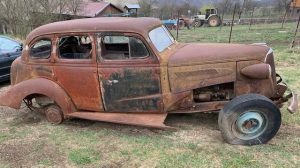 There is a small area of rust right down in the bottom of the passenger side quarter panel, but this could very easily and satisfactorily be repaired with a patch panel, rather than replacing the entire quarter. There are a number of dents and dings around the car, the worst being in the driver’s door. However, these should all be pretty easy to repair. The car wears the correct Mark Donohue duck-tail rear spoiler, but this really proves nothing. 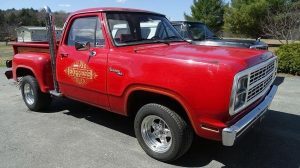 These were readily available to both dealers and customers via AMC’s Group 19 program, so many a regular SST found itself baring an uncanny resemblance to a Donohue Special. Compounding the problem further was the fact that AMC provided no form of VIN or Fender Tag identification for the Special, so the only way to verify the authenticity is via the original dealer order or the Build Sheet. The interior of the Javelin is also a bit of a pleasant surprise. 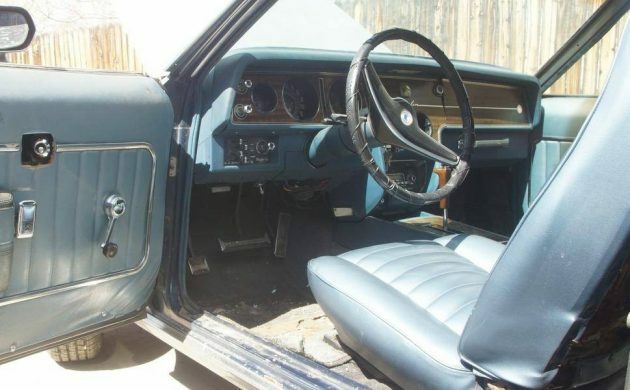 The car came from the factory fitted with an AM/FM radio, and air conditioning. The dash looks good, as does the floor console and seats. The door trims look like they need a bit of re-stretching and securing in the corners. The carpet will probably need replacing, and there are a few minor trim pieces missing, but the overall impression is very positive. News under the hood isn’t quite as good, but it is by no means catastrophic. The 360ci V8 currently doesn’t run, courtesy of a broken timing chain. However, the owner is trying to fix this as time permits, so with any sort of luck, it might be a goer again fairly soon. The car is also fitted with a 3-speed automatic transmission, power steering, power front disc brakes, and that fantastic functional ram air hood. Things look a bit dirty under the hood, but I suspect that it will clean up quite well. 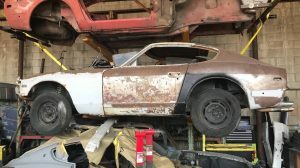 If this 1970 Javelin SST can be made to run again without too much work, then it would appear to represent a pretty decent foundation for a restoration project. It’s a good looking car that seems to only need some minor cosmetic work to really bring it back to life. I know that we’ve got plenty of AMC fans among our readers, so it will be interesting to see if any of them feel the desire to take this one on. Seriously, I thought all Mark Donahue Javelins came with a black interior and an 8 grand tachometer. From the factory. But, this probably is not true. 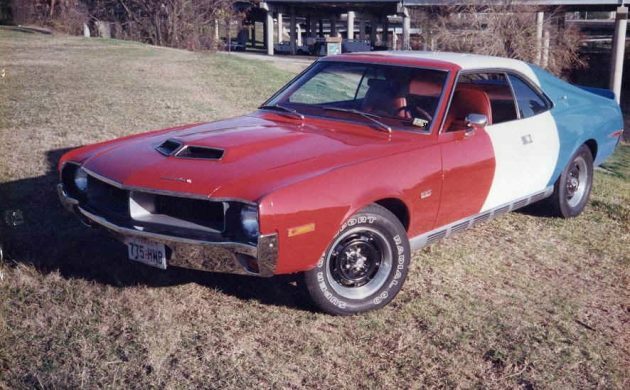 I know one thing ; real (factory built) fake (AMC dealer built) this is a neat Javelin! Oops! Should be “Donohue” ! Spell check! Hey Big_Fun, you are right about the 8-grand tach, but the question of the interior color is a different kettle of fish. There’s no doubt that it is a solid Javelin SST, but whether or not it is a genuine Mark Donohue Special is the great unknown. They could be had in any exterior color, and with any interior trim. I have to tell you that I spent a lot of time in research so that I could sort fact from fiction with a Donohue Special. The definite inclusions were the tach and a floor console. This was regardless of whether the car was optioned with the auto transmission or the T-10 manual. With those options also available on your normal SST as well, it all came down to paperwork to verify the authenticity. Without those papers, it was just impossible to tell. 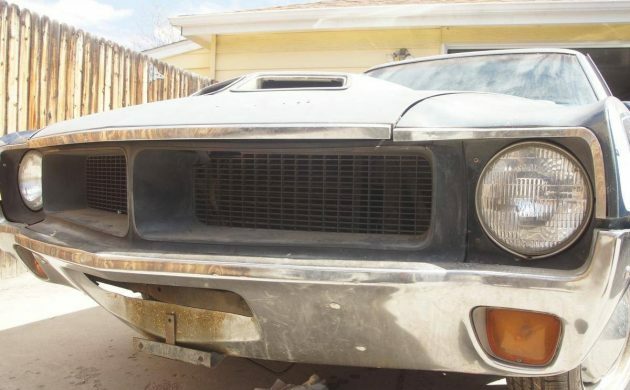 I am no AMC expert, but i am pretty sure that one of the things that make a Donohue (not Donahue) Javelin are unique front and rear spoilers. There is no spoiler present on this car. 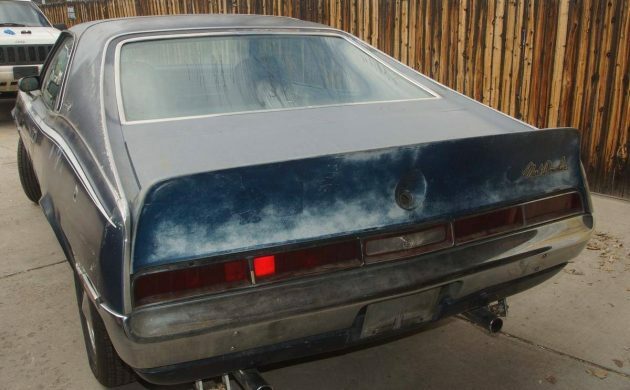 With this and the lack of documentations, I would be wiling to bet that this is a “regular” SST that has had a Donohue rear spoiler that has been added at some point. I would still be proud to own it, but I feel that any potential new owner know what he is purchasing. The Rear Spoiler is on the car and that was the main item that was homologated for SCCA Trans Am competition. For ’70 the rules changed and only required 2500 vehicles to be produced. The hood was part of the Donohue package as well. There was no front spoiler included in the package. Do not mistake this model for the ’69 Javelin Trans Am edition. They only built 100 and they were painted red white and blue. That car had an adjustable rear spoiler. I suspect this car is a legit car, but one should do their due diligence before pulling the trigger. The RWB Trans-Am Javelin was NOT a ’69 model. It was a ’70 Javelin with the rear spoiler from the ’69 Trans-Am racer . . . . . just to confuse us, I suppose. They did a lot of things that way. There must have been a real gremlin or two in the product planning and marketing departments who just liked screwing with people. RC you are correct it was a 1970 model that was Red White and Blue special edition. There was one parked in the Cal Poly Pomona Student parking lot back in the early 80’s. Whoever owned it sometimes parked it next to my Boss 302 or Boss 429 depending on the time frame of my ownership of those cars. 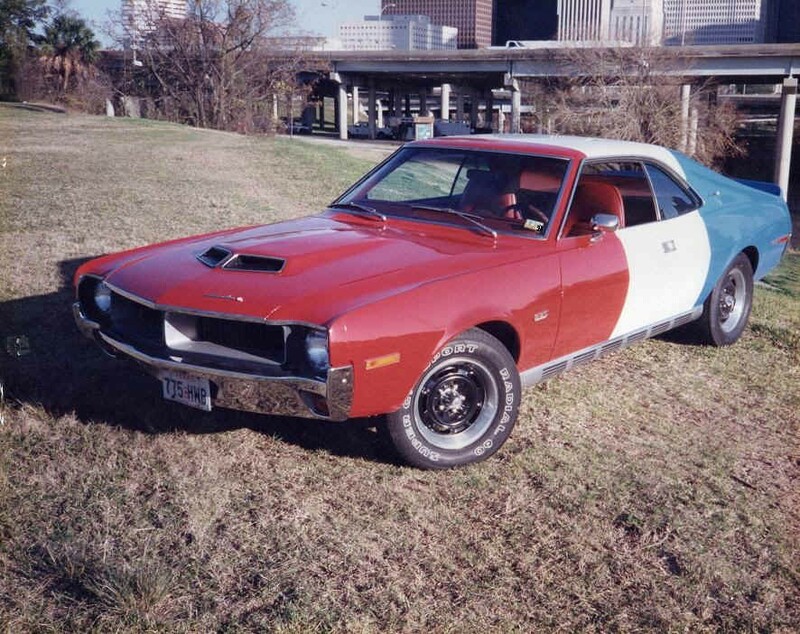 Not big on AMC’s but my mom drove a ’73 Javelin which was equipped with a decal package on the front fenders commemorating AMC’s ’72 Trans Amchampionship. I also am pretty certain that the scooped hood shown on this car was only available as part of the “Go Package”. I would be interested in knowing if there is any way to tell a Go Package car by the VIN, or other identifiers, or if it is like the Donohue package in that it can only be verified with paperwork. My understanding is that there is no way to identify a “Go Pkg” car via the VIN. I have always wondered if it could be done from a build sheet – it it was still in the car. That should be possible if the Go Pkg came from the factory. If it was a dealer installed item then there is no way to tell. Looks solid- paint it up like a Donohue spl?? Might get it cheaper, would be the cats meow with a 4 speed. Good luck to the new owner!! I have been looking for something for awhile and this looked promising in the dare to be different sort of way. Until I saw the broken timing chain part. I have play broken timing chain before and it could be replace the chain and gears and fire it up, but it could also be bent valves or worse. Some of it depends on at what RPM did said failure take place. I’m thinking of maybe a phone call to maybe get some more info, and maybe owner will know more shortly. Have to wait and see. This car needs a lot of work. No radiator, water pump or distributor. Interior is worn. Needs a good paint job. I know these are rare, but, for me, the price is just too high. I love these things…AMX and Javelin…close cousins. I am getting to the point where BF is leaving me jealous, mad, sad envious, etc. Oh, well…..
I’m sure the missing parts you named are with the car. The owner is in the process of repairing the timing chain. 70 Javelins have highest rate of cannibalism of all 1968 thru 74 AMX & Javelins Series, due to their 1 year only parts. No! Nothing in VIN will show a AMC had Go Pack. Not all Donohues have Go Pack either. And you have some 304 4 barrel “M” code (won’t find that in shop manuals) and also have column shift cars. Some column shift cars had dead consoles. That is, while column shift, the console is covered up with woodgrain. 1970 only those. 70 Trans Am Javelin totally different car. You could get any production color on a 1970 Mark Donohue Javelin and interior colors varied, not all black either. The Ed Hooper Mark Donohue is a non Go Pack car. of course spoiler missing but this is one of the dozens I have documented non go pack, not big deal. 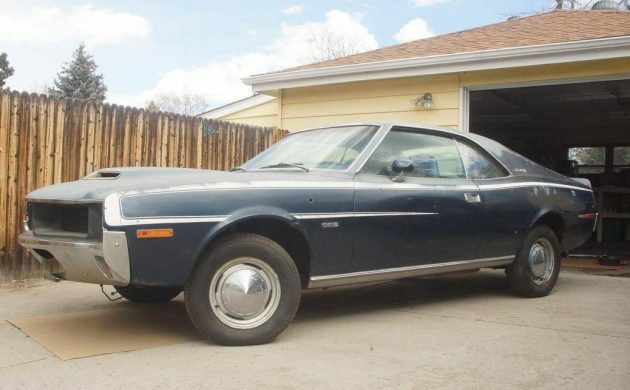 Hope someone ends up with this neat 1970 Javelin!